Canadian hipster and fashion plate, Justin Trudeau hit the curl of the pro-Venezuela coup meme now sweeping the Globe early. Addressing a St. Catharines, Ontario crowd, crammed into the gym at Brock University last week,1 the shirt-sleeved PM mustered to the marrow his democracy-defending indignation, damning the South American country's leader as a "dictator" not possessing electoral legitimacy. "Anyone who contends they are a friend to the Venezuelan people should be very clear in standing up and condemning the Maduro government, that has been responsible for terrible oppression, for terrible marginalization, for a humanitarian crisis the likes of which South America has not seen in a long time, leading to mass exodus, [and] tremendous number of refugees fleeing all across South America. "ALL because of an illegitimate dictator named Maduro, who is continuing to not respect their constitution, the rule of law, and the principles of what is fair and true for the future." We can all agree, the situation now is terrible and oppressive, and the people of Latin America have been marginalized something awful these past years. Watching them flee in their tremendous numbers towards the refuge America promises has since moved President Trump to stern actions to staunch the flow, stem the tide, and gird the loins of his nation's southern border in steel and concrete where possible, in hopes the power of dissuasion will convince those desperate considering leaving the ills of their troubled lands to instead stay home and make their own societies greater. But, the situation hasn't always been so dire. Latin America's Pink Tide hit the high water mark in 2009. Social reforms led by Cuba and Venezuela and taken up by Bolivia, Ecuador, Brazil, Argentina, Chile, (and even to a lesser extent Peru) seemed to promise a better, fairer, truer future for the poor majority. Manuel "Mel" Zelaya, (right) the telegenic, charismatic president of Honduras was, like Justin Trudeau, regarded a true blue, centrist democrat. Though a member of the landed gentry he'd made agrarian and wage reforms, and his modest efforts had begun to bear some fruit; remarkable considering the entrenched depth and long legacy of Honduras' political corruption. 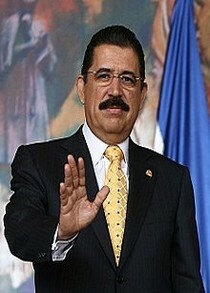 In the last year of his mandate, Zelaya hoped to strengthen the democratic trajectory he'd set for the country. Those dark times, happily for the people of Honduras and their true friends lay far in the past in 2009. But, they wouldn't remain so. On the pre-dawn summer morning of June 28th, 2009, Honduran commandos, following orders issued by the country's Supreme Court, dragged Mel Zelaya out of bed, bundling the president into a jeep and spiriting him away to a waiting plane bound for Costa Rica. His crime: introducing a Non-binding referendum, putting before the people the prospect of establishing a constituent assembly, in hopes of reforming the constitution along more democratic lines. "The Obama administration has since been able to recruit the right-wing governments of Canada, Panama, and Colombia, and also Peru, to recognize the elections. But its support for these undemocratic elections – to which the OAS, European Union, and the Carter Center all refused to send observers – has left the Obama administration as isolated as its predecessor in the hemisphere." More than its fellow "right-wing" governments, Canada under Conservative Party prime minister, Stephen Harper was first among equals to endorse the plotters, and quick to sign a Free Trade agreement with the new "government", sealing the deal as it were. But, in fairness to Harper, his Liberal opposition, where at this time young Justin was cutting his teeth as a new MP and party critic for youth and multiculturalism, would have done the same thing, if not so quickly. It merely follows a bipartisan pattern of Canadian political behaviour going way back. "I can see no useful purpose to withholding recognition unduly. Indeed, such action might even tend to delay Chile's eventual return to the democratic process." Engler's books also chronicle in detail the painful truth, for those still harbouring the illusion of Canada's manufactured image as "international benefactor", of his country's perfidy in the service of trans-national corporate wealth and national political advantage to the disadvantage of the citizens of not only Latin America, but in Africa, the Middle East, Asia, and the Caribbean, (including Cuba). 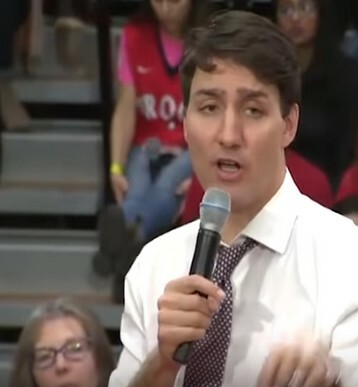 So, maybe it's not such a surprise witnessing Justin Trudeau's disdain for Nicholas Maduro performed as vividly in St. Catharines after all, given his country's historical anathema for democracy as expressed abroad. Postscript: Canada's foreign minister, Chrystia Freeland has announced Canada will soon host a meeting of the so-called "Lima Group", a collection of anti-democratic nations who have tried to hijack, with the aid of the Organization of American States, what little remains of national sovereignty among the remnant nations of Latin America's once swelling Pink Tide to decide Venezuela's future, "fair and true".